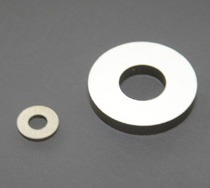 NTK’s piezoelectric ceramics come in navy types I, II, and III, including hard and soft types, and can meet a wide variety of needs, such as general industrial applications and medical applications. Contact NTK Technologies for more details. Rings of 10 to 70 mm in diameter are available as series products. *Ultrasonic wave oscillator devices are products basically manufactured on a per-order basis. Please ask us about delivery periods. *NTK also offers custom-made products.